Will Berkeley become an electric car capital? With months to go before the first mass production electric cars hit American streets, the $41,000 question (before rebates and tax incentives) is whether drivers will buy them en masse. Which is why you should keep your eye on Berkeley, Calif. While I would hardly hold out my hometown as an avatar of mainstream American values, on the environmental front it’s often been in the vanguard of things to come, like curbside recycling. Take hybrid cars. When I was reporting a story earlier this year on the San Francisco Bay Area as the launch pad for mass-market electric cars, Andrew Tang, an executive with PG&E, told me that the utility was closely watching local sales of the Toyota Prius as a proxy for likely purchases of electric cars. Studying Prius distribution helped PG&E create a heat map of neighborhoods where the electricity demand might spike. In Berkeley, he said, one out of every five cars sold for the past four years has been a Prius. Made sense to me. Priuses seem as common as Obama bumper stickers and are just part of the visual landscape, like Alice Waters. But it wasn’t until my friend Mike and his son Bryce were visiting from Texas recently that the hybridization of Berkeley really became apparent to me. We were at REI picking up some gear for a camping trip when Bryce remarked that he had counted eight Priuses in the store’s rather small parking lot. On the 2.8-mile drive home we decided to see how many Priuses we could spot along the road into the Berkeley Hills. We counted 34, including four on my block. 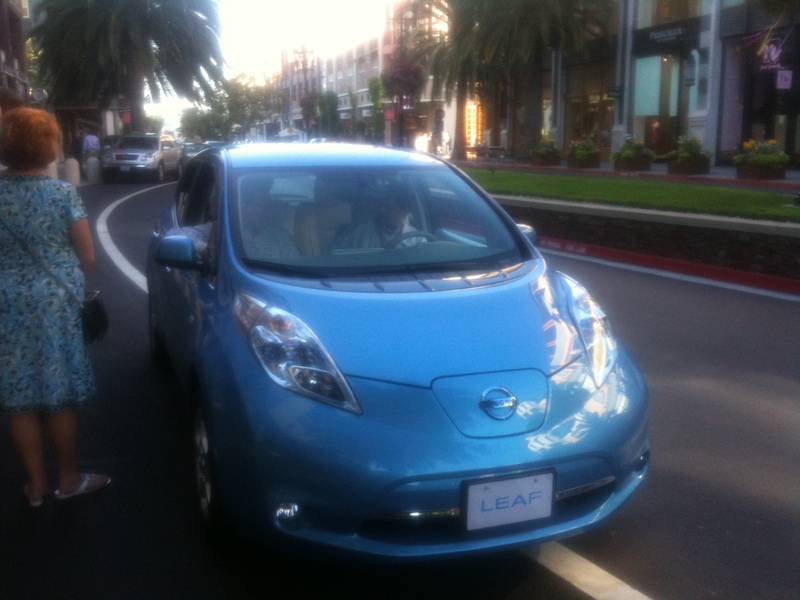 A few weeks later I played the Prius game on the way down the hill to the Berkeley Bowl to pick up some groceries. I counted 25 Priuses, two Honda Insight hybrids, an old Toyota RAV4 electric and one gunmetal gray Tesla Roadster. The Chevrolet Volt may be a harder sell, given it is an electric hybrid and boasts a muscular all-American look that you don’t see too often on the streets here. But every Prius owner won’t have to switch to electric in order to have an impact. Seeing a Leaf or Volt in the neighbor’s driveway or in the REI parking lot will make an electric car less a curiosity and more just another automotive option when trading in that ’95 Volvo station wagon. You are correct. Berkeley will be one of the best early adopter areas for electric cars and one of the first to have 100+ electric charge stations.